Get One of the Top 50 Plumbing Blogs Directly to Your Inbox! It seems like you just closed your eyes, and before you know it, the alarm clock is waking you from your slumber. The only motivation you have to get out of that bed? How good a long, hot shower is going to feel. But when you turn the faucet handle, cold water rains down on you (on the opposite end of the spectrum, you’re looking for a cold-water wake-me-up only to receive water with the heat of a thousand suns). So what’s the deal, and what’s the fix? Sacramento, we’re here to help. 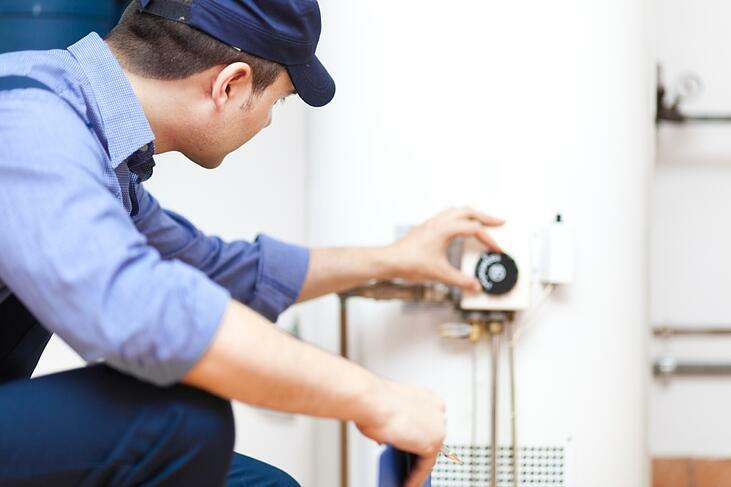 Unlike repairing a water heater, adjusting it is a simple task that generally doesn’t require calling in the experts. First, a little background information. Your hot water heater thermostat regulates the temperature in the water heater. If the temperature is too low, water becomes cold before it reaches the faucet (Brrr…). If it’s set too high, cooling doesn’t occur and you risk possible burning and scalding of your skin (Ouch!). To avoid either scenario, most thermostats have a control that allows you to set the temperature to your personal preference. To be sure your temperature is properly regulated, you should be sure to check it occasionally. It’s a DIY job that your wallet will thank you for. To make adjustments, locate the temperature control knob that is connected to the water heater heat source; you’ll typically find this on the front of the water heater, toward the bottom. Most temperature adjusters are red and easily spotted, with numbers and lines much like an oven knob. Directly above the knob, you’ll find a small black arrow; it lines up with the marking on the control knob itself. This indicates the current temperature (depending on the make and model of the water heater, it may also be labeled cold, warm, hot, or similar). It may also have specific settings notated with different colored lines (generally white at 110 degrees and black at 120 degrees). To get the temperature just right, turn the control knob counterclockwise to lower the temperature, or clockwise to increase the temperature. And never turn the control knob past the maximum temperature. High temperatures have been known to increase the likelihood of scalding after just one second of exposure; in fact, the American Burn Association reports that over 300,000 admissions to burn centers and emergency rooms are a result of scalding. A word of advice: many manufacturers preset the thermostat at or above 140 degrees fahrenheit. However, most homes only need to be set at 120-130 degrees. At 140 degrees, scalding can occur within five seconds; however, at 130 degrees, scalding won’t happen until just under one minute—long after you or your loved ones have decided “it’s getting hot in here” and stepped out of the shower. Plus, at 130 degrees, water is hot enough for optimum cleaning and for removing bacteria in a dishwasher. And we haven’t even mentioned the potential savings yet! Eliminating those extra pre-set degrees could lower your water bill by as much as $200 per year! Still having water heater troubles? Call the experts at Sacramento's own Express Sewer and Drain. If you’ve got problems with your water heater, we can help! 3 Warning Signs That Your Water Heater is on the Fritz!